(AP)—Accompanied by a fleet of astronauts spanning NASA's entire existence, Atlantis made a slow, solemn journey to retirement Friday, the last space shuttle to orbit the world and the last to leave NASA's nest. 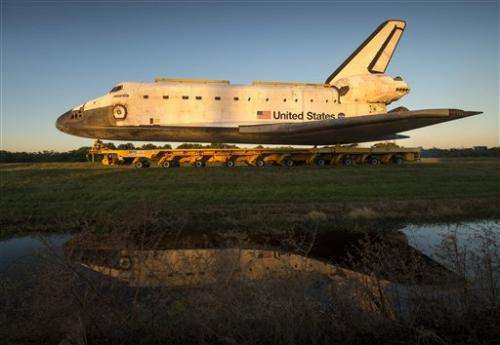 Atlantis reached its new home at the Kennedy Space Center's main tourist stop close to sundown, after a one-way road trip that spanned nearly 12 hours. A couple dozen astronauts spanning NASA's Mercury, Gemini, Apollo and space shuttle programs—moonwalkers included—welcomed Atlantis to its new $100 million exhibit, still under construction. The hardier ones walked alongside the spaceship for the home stretch. Among the big astronaut names: Mercury's Scott Carpenter, Apollo 11's Buzz Aldrin and Eileen Collins, the first female shuttle commander. It was a day full of fanfare and farewells. Atlantis began the 10-mile (16-kilometer) trek just before dawn, emerging from the massive Vehicle Assembly Building and riding atop a 76-wheeled platform. About 200 workers gathered in the early morning chill to see the spaceship out in the open for the final time. They were joined by the four astronauts who closed out the shuttle program aboard Atlantis more than a year ago. 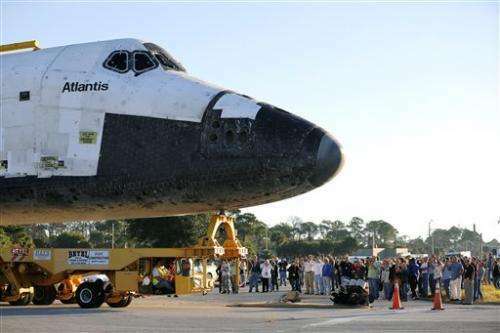 "My opinion is it looks better vertically," said Christopher Ferguson, the commander of Atlantis' final flight. "It's a short trip. It's taking a day," he added. "It traveled a lot faster in its former life. But that's OK. ... it's got a new role." Portions of Atlantis' final launch countdown boomed over loudspeakers before the shuttle hit the road. Employees gathered in front of a long white banner that read, "We Made History," and below that the single word "Atlantis." They followed the spaceship for a block or two, then scattered as the shuttle transporter revved up to its maximum 2 mph. The convoy included a dozen trucks and vans, their lights blinking. The fact that several hundred shuttle workers are about to lose their jobs, now that Atlantis is being turned over to the visitor complex, dampened the mood. Thousands already have been laid off. "The untold story of the last couple years, the last missions that we flew, is the work force. I mean, the contractors knew that their numbers were going to go down ... and yet they kept doing their jobs," said NASA's Angie Brewer, who was once in charge of getting Atlantis ready for flight. Some were too upset to even show up. 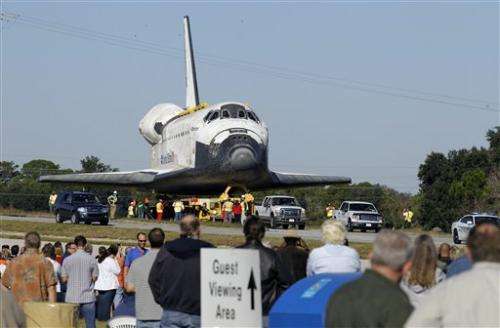 Friday's event marked the true end to the 30-year shuttle program. Seeing so many members of the shuttle team "helps soften the hard edge of seeing Atlantis go off to a museum," said astronaut Rex Walheim, part of the ship's final crew. Atlantis made its way down broad industrial avenues, most of them off-limits to the public. So the trek did not replicate the narrow, stop-and-go turns Endeavour encountered last month while navigating downtown Los Angeles. The mastermind behind Atlantis' slow march through Kennedy was sweating bullets nonetheless. "It's only a priceless artifact driving 9.8 miles (15.8 kilometers) and it weighs 164,000 pounds (74,390 kilograms)," said Tim Macy, director of project development and construction for Kennedy's visitor complex operator, the company Delaware North. "Other than that, no pressure at all," Macy said, laughing. "Only the eyes of the country and the world and everybody at NASA is watching us." 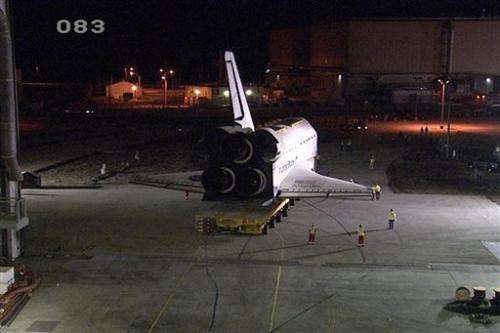 The relocation of Atlantis was plotted out for months, he noted last week, and experienced shuttle workers took part. 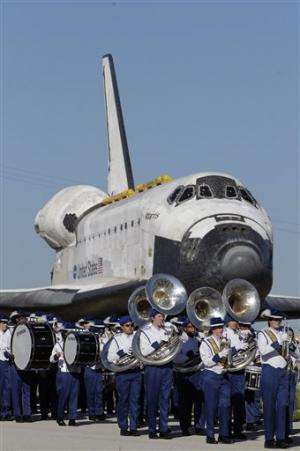 The roundabout loop took Atlantis past Kennedy's headquarters building for a midmorning ceremony that drew several thousand past and present employees, and their guests, as well as a few dozen astronauts. A high school color guard and band led the way. The mood was more upbeat than when the trip began four hours earlier and resembled a funeral procession. NASA officials went out of their way to emphasize the space agency's future. "It's an incredibly historic day," said NASA Administrator Charles Bolden Jr., a former skipper of Atlantis. "But I don't preside over an agency that's in the history business. ... We're in the business of creating the future." Bolden proudly cited NASA's new target destinations for astronauts—an asteroid and Mars—and he hailed the successful start to commercial supply missions to the International Space Station. The next stop for Atlantis, meanwhile, was a still-under-design industrial park that offered a few hours of public viewing in the afternoon. Tourist tickets ran as high as $90 apiece for a chance to see the spaceship up close. Crews removed 120 light poles, 23 traffic signals and 56 traffic signs in order for Atlantis to squeeze by. One high-voltage power line also had to come down. Staff trimmed back some scrub pines, but there was none of the widespread tree-axing that occurred in Los Angeles. Atlantis had to traverse just one noticeable incline, a highway ramp. The rest of the course is sea-level flat. Tourists jammed the public portion of Atlantis' route. Patricia LeBlanc, visiting from Orlando with her daughter, said she misses the shuttle launches. Thirteen-year-old Ashley Gest, waiting in line for astronaut autographs with her Ormond Beach family, was excited to see Atlantis but expressed sadness, too. The grand entrance into Atlantis' new home went just as smoothly Friday evening and attracted a huge crowd. One complete wall of the exhibit hall was kept off, carport-style, so the shuttle could roll right in. Construction will begin on the missing wall early next week. Once safely inside, Atlantis will be plastic-wrapped for protection until the building is completed. The grand opening is set for July 2013. Delaware North is footing the entire $100 million exhibit cost. Discovery, the oldest and most-traveled space shuttle, was the first to leave Kennedy, zooming off to the Smithsonian in northern Virginia in April atop a modified jumbo jet. 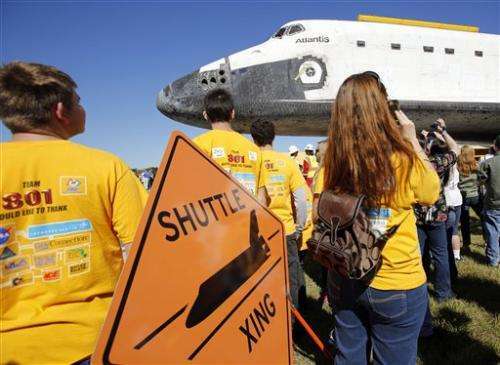 The shuttle prototype Enterprise went from the Smithsonian to the Intrepid Sea, Air and Space Museum in New York City; NASA confirmed Friday that Enterprise suffered minor damage to its vertical tail due to Superstorm Sandy earlier this week. Endeavour, the baby of the fleet, headed west in September. "Although it's the end of Atlantis flying in space, it's not the end. It's not the end for KSC," stressed Kennedy Space Center director Robert Cabana, a former astronaut. "And it's not the end for Atlantis because Atlantis now takes on a mission of inspiration to future generations."